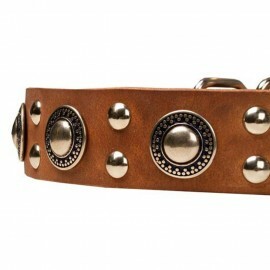 Leather Dog Collars There are 72 products. 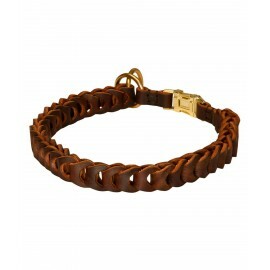 Exclusive braided leather dog collar for Labrador obedience training. Gorgeous design. Selected quality. Safe and effective for behavior correction. Quick-release brass buckle. Luxury brass hardware. Doesn't spoil your Lab's coat. Helps to teach leash manners. 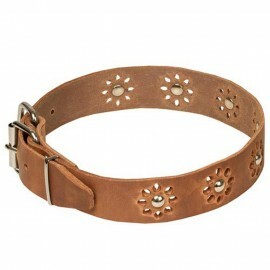 Flowered leather dog collar decorated with punched flowers and nickel-plated studs. Handmade of selected leather. 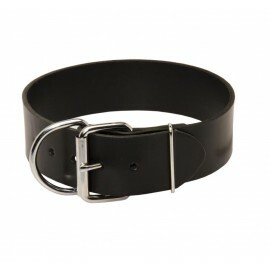 Equipped with solid rustproof nickel-plated buckle to regulate the collar size and D-ring to fasten the leash. Rounded edges. Smoothed leather. Spring-summer style. 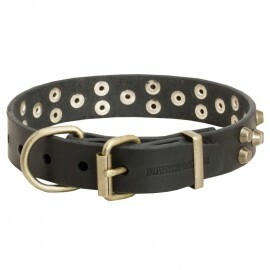 Ideal Labrador walking collar. 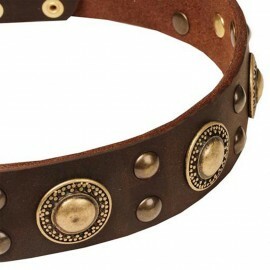 Premium quality leather dog collar with vintage round plates and studs. Decorative dog collar to emphasize the beauty of your Lab. Finest materials. Made by hands. Corrosion-resistant hardware. Ideal combination of quality, comfort and design! Incredibly looking Labrador collar for walks in style! Selected leather with rounded edges. Gold-like brass circles and studs. Hand work. Rust-resistant solid hardware. Excellent combo of super quality, comfort, safety and amazing design. Let your Labrador walk with proud! 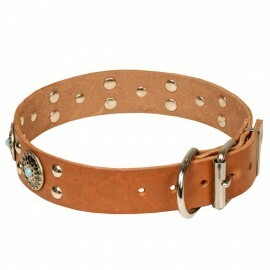 Natural leather dog collar with silver-like embossed round plates and azure stones. Excellent accessory to lay emphasis on your Lab. Unusual design. Top quality materials. Exceptional comfort. Safe for dog's hair and neck. Resistant to rust fitments. No rubbing or hair tearing. Awesome collar for your Labrador! Narrow leather dog collar with attractive chrome-plated pyramids for Labrador walking. Handmade of the best leather. Well worked edges. Maximum safe for dog's neck and fur. Solid chrome-plated buckle and D-ring. 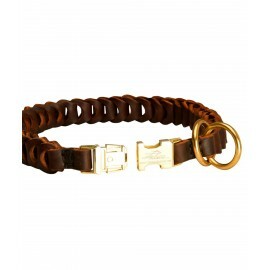 Super strong, reliable and elegant Labrador collar. Designer dog collar for Labrador Retriever. Super combo of style and functionality! Handmade of top quality natural leather. Decorated with gold brass pyramids. Very strong and reliable. Pleasant for the dog to wear. Perfect for Labrador walking. 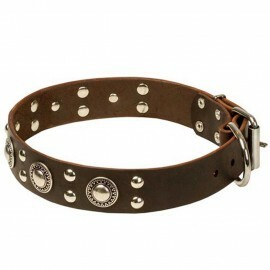 Studded leather dog collar for Labrador Retriever handling. Pleasant to wear. Safe. Secure. 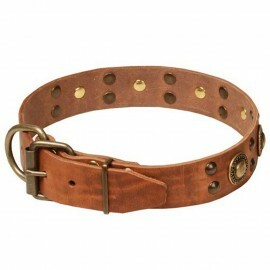 The finest leather and rustproof nickel-plated details were used for this Labrador collar. 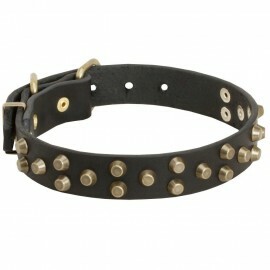 Style and functionality in one dog collar!